I love to make clothes. I really want to make more for myself, but it’s so much easier, faster, and cheaper (because you don’t use as much fabric) to make clothes for my daughter. So, I wanted to come up with something that was easy, fast, and thrifty to share to make. That is where the No Sew Poncho comes in. It literally took me fifteen minutes! 1. Fold your fabric in half height wise. Then fold it again width wise. 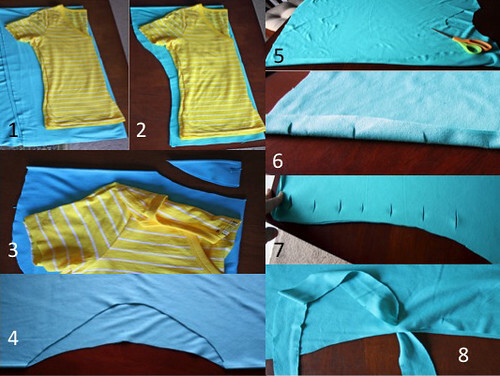 Fold your shirt in place and place on top of fabric, matching the center fold. The top of the shirt should be on the top fold and the bottom fabric will be edges as will the side with the arms. 2. Cut a basic silouhette of your shirt on the fabric. 4. 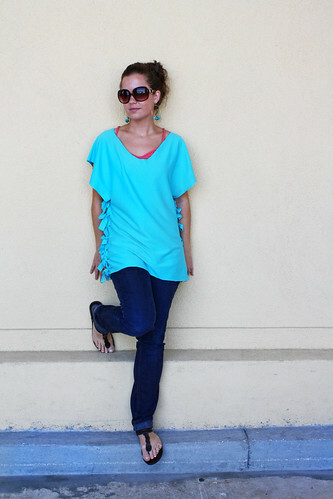 Open up shirt and cut the front neck a little farther down. 5. Turn one side of the shirt in. 6. Clip down the shirt with scissors. Make sure you start to clip past where the armhole will be. Leave about an inch or two inbetween clips. It’s your preference though, so you could do a lot of clips or less. 7. Open and see making sure everything looks okay. 8. Use leftover fabrics, ribbon, etc. to tie the sides together. I used a tie in every single slit, but you could also do a really long piece and weave it in and out to hold it together. All done! Now through it over a cute tank top or shirt and off you go 🙂 Happy Crafting! 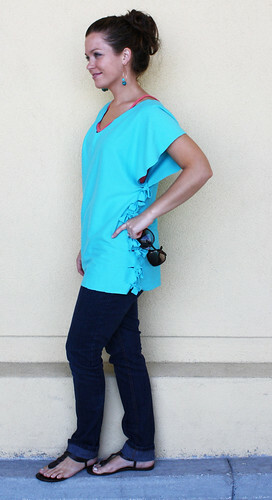 Catch My No Sew Poncho Tutorial at BCD Today! GACK! I LOVE THIS!!! Fabric shop here I come….thanks so much for this great tute! LUVLUVLUV!!!! Being a non-sewer, this tutorial is fantastic!! Thanks for sharing! I’m headed to the fabric store this weekend…. lol! I’m 10. I made it, it was a bit too big, so I modified it and it looks super hyper cute!!!!!! I am going to wear this everywhere! Thx so much! P.S. I wish I could be as pretty as you!